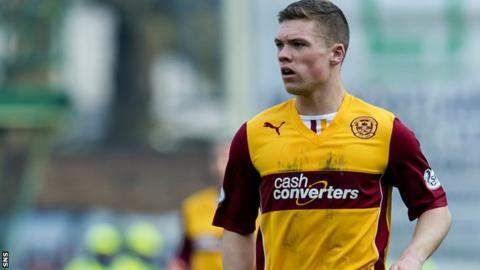 Motherwell forward Craig Moore could be out for the rest of 2014 after rupturing his cruciate ligament. The 19-year-old limped off in the final moments of Wednesday's 2-1 win over Inverness, having twisted his right knee late in the game. Moore told the Motherwell website he was "absolutely devastated" but was "determined to come back bigger and better". The Steelmen finish their season with a trip to Aberdeen on Sunday. The injury for Moore followed a challenge by Gary Warren and Well manager Stuart McCall said: "It looked to be such an innocuous fall, it's such a blow to learn it is so serious. "That being said, with the type of kid Craig is, I am sure he will meet it head on and get himself back better than ever." Motherwell had already sealed a Europa League qualifying berth for next season before the victory over Inverness but the three points kept McCall's men in the hunt for finishing second in the Scottish Premiership. They trail the Dons by a point ahead of the weekend meeting at Pittodrie.